Contractor wheelbarrow. Heavy gauge seamless steeltray with front tray braces, "H" brace, steel cross strips and leg stabilizers. 16" wheel assembly with pneumatic 2-ply tire with oilube bearing. 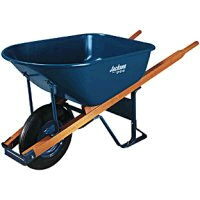 * Please call us for any questions on our wheelbarrow 6 1/4 cu. ft. serving Honolulu, Waikiki and surrounding communities on Oahu.